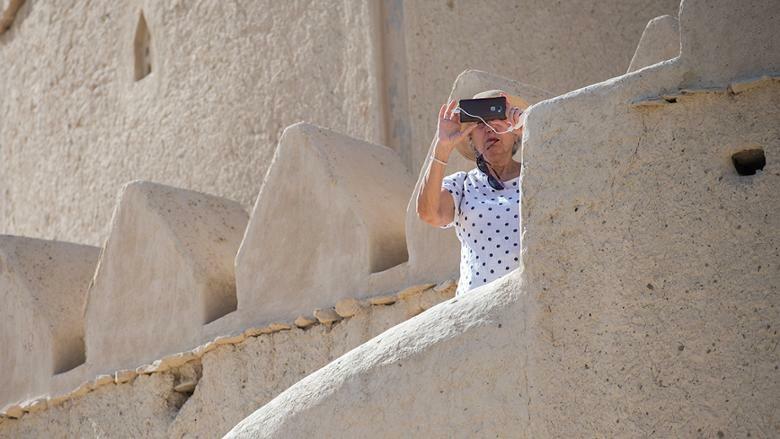 Perhaps no monument is as symbolic of the history of the UAE and so deeply entrenched with the lives of the ruling Al Nahyan family as the century-old, sun-dried mud brick Al Jahili Fort in Al Ain. 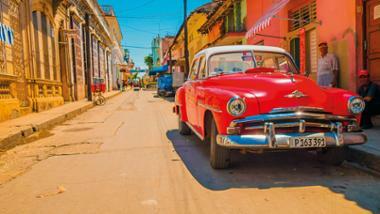 One of the UAE’s most iconic historical monuments, it served both as a royal summer residence and a symbol of power. And just how much its distinctive four-storey circular tower reflects the nation’s pride, history and culture is evident from its presence on the back of the UAE’s Dh50 banknote — a picture that predates the renovation and restoration work undertaken by the Abu Dhabi Authority for Culture and Heritage in the 1980s. On a bright sunny morning, following a 90-minute drive from Dubai, as we walk towards the imposing entrance of this magnificent fortified structure, we are joined by a bus-load of tourists who click away at the stunning façade of its monumental multi-foil arched entrance, flanked by two large round towers. 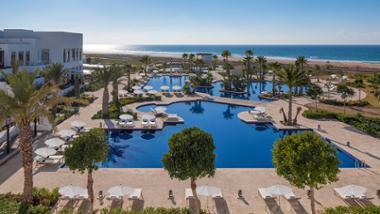 We enter into a wide, open courtyard surrounded on all sides by sand-coloured walls and towers and are greeted by the delightful chirping of birds resting in the boughs of the towering trees. 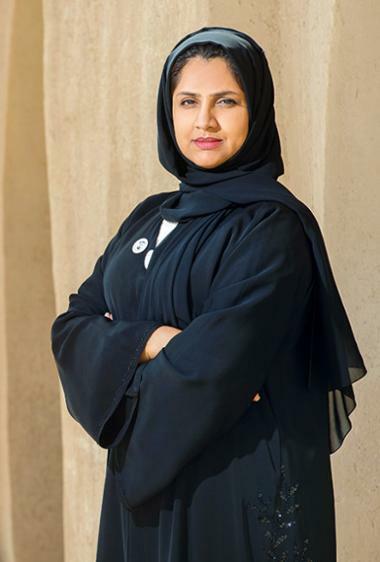 It is here at the Visitor’s Centre that we meet Huda Salem Al Musaabi of the Department of Culture & Tourism, who proceeds to take us on a guided tour of the Fort; and offers us a glimpse into its illustrious history. Over a welcoming cup of Arabic coffee and bowl of dates, Huda explains how the more temperate weather of Al Ain — a lush green oasis, with an array of palm groves and natural springs — prompted Shaikh Zayed the First (Zayed Bin Khalifa Al Nahyan, 1836-1909), leader of the Bani Yas tribe and grandfather of the UAE’s founder, Shaikh Zayed Bin Sultan Al Nahyan, to build a summer residence here. ‘Low humid conditions in Al Ain, and the presence of fresh water and fertile land, was seen as a welcome respite from the intense heat and humidity of the coast of Abu Dhabi especially in the peak summer period lasting from June to September,’ she says. Restoration work undertaken here in recent times have led to the discovery of a falaj system running under the Fort into the nearby oases, she reveals. 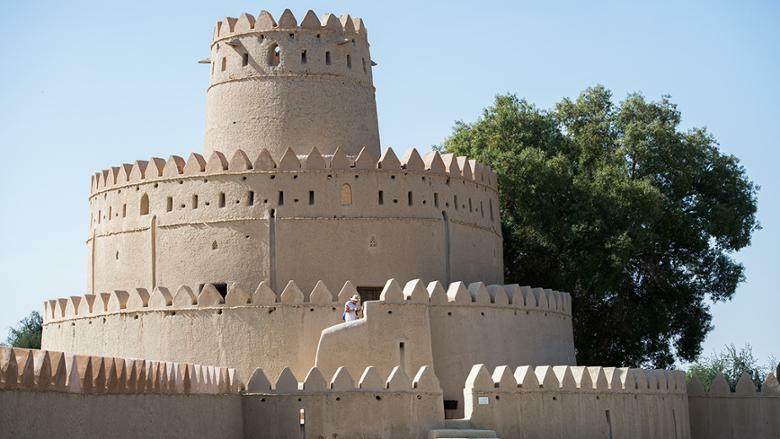 The style of fortifications incorporating traditional architectural elements is similar to that of the third millennium BCE — as is evident from discoveries made at the Hili archaeological site in Al Ain, she adds. We walk across the courtyard to the gate in the southern wall, which was originally the main entrance of the old Fort. Here, above the carved double wooden door, hangs a commemorative plate stating its date of completion — Islamic year 1316, 1898, and a short verse in praise of Shaikh Zayed the First is inscribed in spectacular Arabic calligraphy. Entering the arched doorway, we step into another courtyard — a traditional design element that enhances air flow and thermal comfort inside the structure. Here, occupying pride of place is a magnificent installation featuring 308 bread paddles — almost identical to wooden oars — and tied to each other in a circular shape to illustrate the themes of the endless migration of humans and the circle of life. 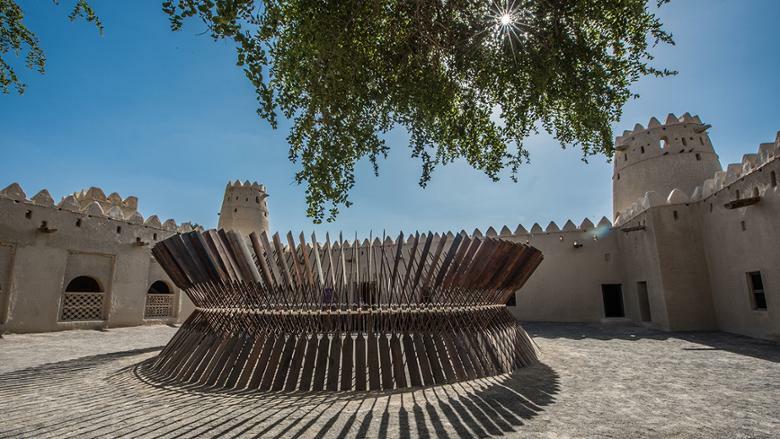 ‘Following its restoration a decade ago, Al Jahili Fort has now positioned itself as a bastion of culture and heritage,’ says Huda, explaining the presence of the art installation. Titled Sun Boats, Egyptian artist Moataz Nasr’s work is approximately 10 metres in diameter and 3.5 metres in height and is inspired by mankind’s constant state of motion, an infinite circle and visually depicts the endless, interconnected movement of human beings on earth seeking a better life. Light and shade combine forces to cast mesmerising patterns on the ground — both of the installation and the crenellated walkways — and as the rays keep shifting, so does the imagery below our feet. This interplay of light and shade also casts its spell in the passageways featuring delicate mashrabiyas, a traditional Islamic window element with its characteristic latticework that not only offers protection against the sunlight but also privacy for its occupants. Huda leads us to an old well — now unused — that once supplied water to the ruling family and those who dwelled in the nearby oases. We walk through the various rooms used by the royal household — there are 11 in all, and also notice a small tandoor oven that probably was used in later years by army troops. 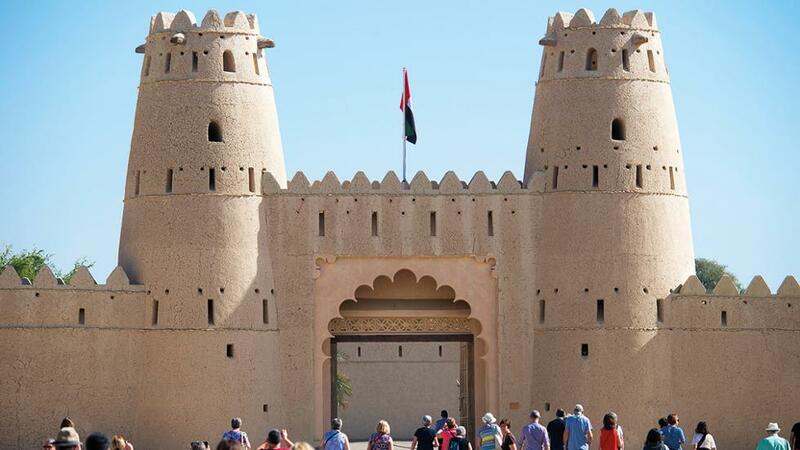 Following the formation of the UAE in 1971, it was a decade later in the 1980s that the government of Abu Dhabi undertook the first major restoration work on the Fort and soon the vast courtyard became a fitting locale for cultural events. 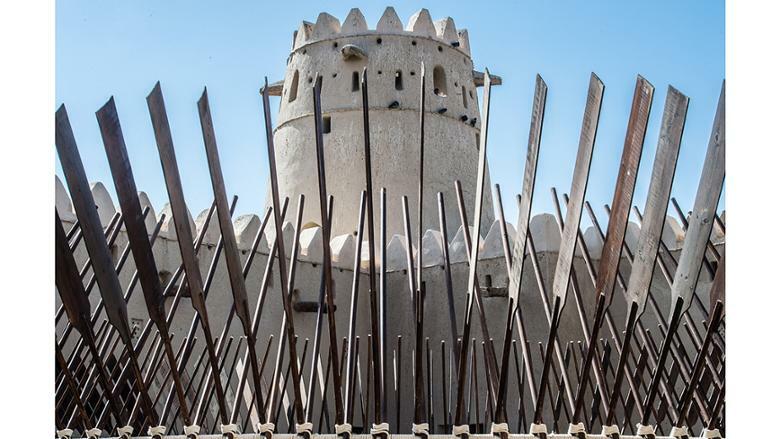 But it was the second major restoration programme undertaken in 2007-08 under the supervision of the Department of Culture and Heritage — Abu Dhabi (Adach) that saw the Fort and the mosque attached to it take its final form and appearance as it is today, she adds. 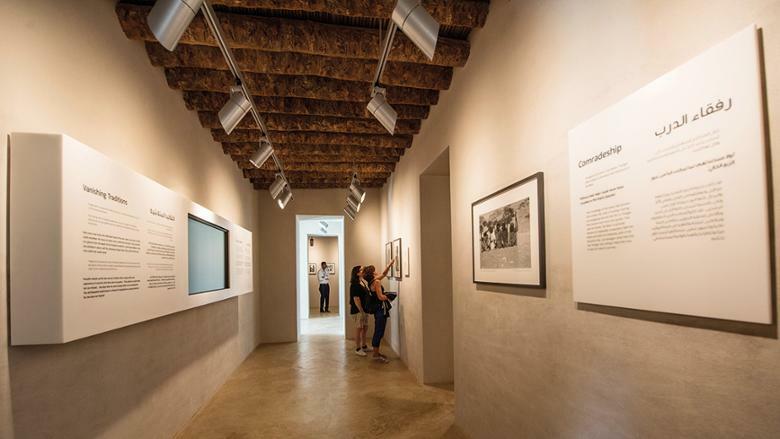 With meticulous planning and using a combination of traditional materials and modern technologies, specialists followed the existing historical pattern of the Fort’s grounds and evidence from archaeology and historic photographs while creating its architectural design. 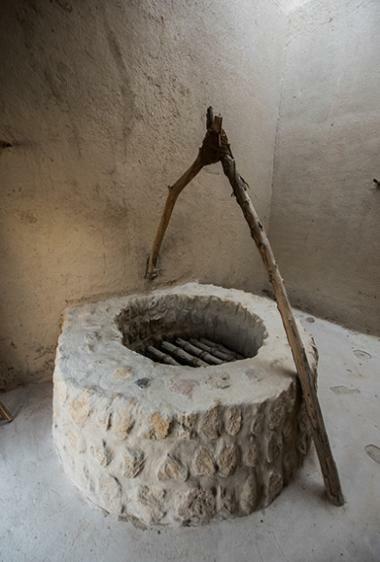 Thus, mud blocks, straw, palm logs and leaves, and even reclaimed building materials from the Fort were combined with an innovative system of embedding cold water pipes into the mud plaster of the walls to restore the fabric and value of the building and maintain its sustainable character. 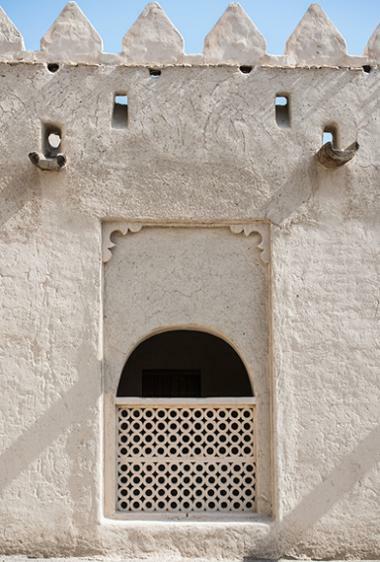 ‘The existing thermal qualities of the traditional mud brick architecture was enhanced with the presence of chilled water pipes to provide cooling that ensures the temperature inside the Fort remains a comfortable 22 degrees Celsius, negating the need for air-conditioning,’ explains Huda. 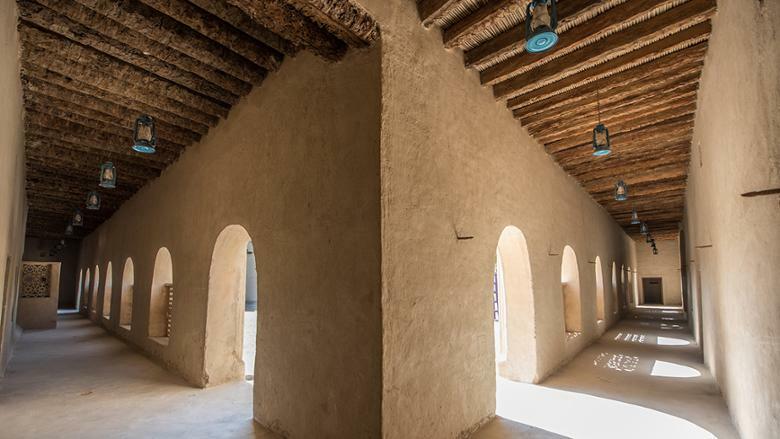 This ambitious refurbishment project raised the profile of earthen buildings to the architectural heritage of the UAE and in 2016, it won the coveted Terra award for Internal Design and Layout thanks to the exceptional technical standards adopted for its restoration. The series of black-and-white photos taken by Sir Thesiger during his five years exploring the Arabian Peninsula also includes an image of the Al Jahili Fort surrounded by sand dunes and ghaf trees. His images have beautifully captured for posterity, life of the pre-oil era in the region and his descriptions of the harsh life in the desert are poignant memories of a not-so-distant past — and it is easy to see why he called this period ‘the five happiest years of my life’. Open daily 9am to 5pm, except Mondays. Fridays 3pm to 5pm. Location Al Mutawaa area, near Al Jahili Park.